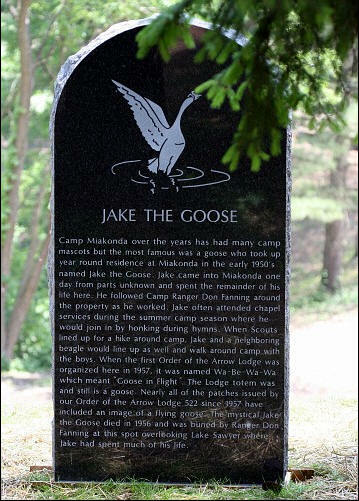 Camp Miakonda, Ohio’s oldest Boy Scout camp located in Toledo, Ohio, over the years has had a number of camp mascots but the most famous was a goose who took up year round residence at Miakonda in the early 1950s named Jake the Goose. Jake came into Miakonda one day from parts unknown and spent the remainder of his life there. He lived at Miakonda year round and followed Camp Ranger Don Fanning around the property as he worked each day. Ranger Fanning fed Jake during the winter months and Boy Scouts kept him fed during the summer months. Jake often attended chapel services during the summer camp season where he would join in, honking during hymns. When Scouts would line up for a hike around camp, Jake and a neighboring beagle would line up as well and beagle, goose and boys could be seen walking around camp together. Jake’s dark side would come out though when an unsuspecting Scout would be walking with food in hand within eyesight of the goose. Jake would then chase down the scout like a coyote pouncing on a rabbit. Mario Andretti would have been proud of the speed some of the Scouts reached while evading Jake. 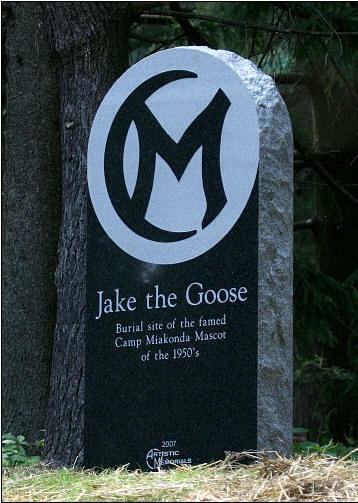 The mystical goose died in 1956 and was buried by Ranger Don Fanning on a hill overlooking Lake Sawyer and the camp chapel where Jake had spent much of his life. Jake was immortalized in 1957 when the first Order of the Arrow Lodge at Camp Miakonda was named in his honor and his image became the totem of the newly organized Order of the Arrow Lodge 522 at Camp Miakonda. The lodge was named Wa-Be-Wa-Wa which meant “Goose in Flight”. Nearly all of the patches issued by Order of the Arrow Lodge since 1957 have included an image of a flying goose. On June 2, 2007 during the camp’s 90th anniversary event, a five foot tall black granite tombstone weighing three quarters of a ton was placed on the burial spot of the fabled goose. The marker includes the story of the goose and an etching of it from a photograph taken in the early 1950’s. 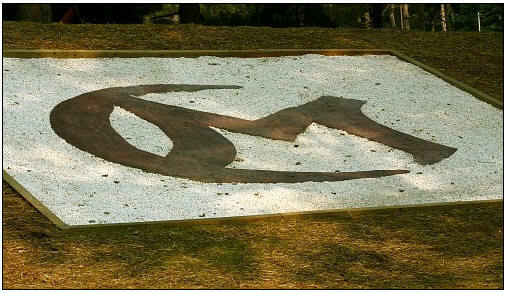 Beneath the marker on the hillside below a large twenty foot diameter concrete camp logo was imbedded into the hillside to mark “Jake’s Hill”. Ten tons of crushed white marble was placed around the hillside logo.